Born on 21 April 1889 in Manchester, England - brother of Louise Thorpe[?] White, Reading[? ], England - at the time of his enlistment in 1915: trade as cook; single; no current military service; previously served with the 1st Manchester Regiment (private, eight years); Church of England; height of 5 feet 4.75 inches; chest of 36 inches fully expanded; fresh complexion; brown eyes; brown hair. 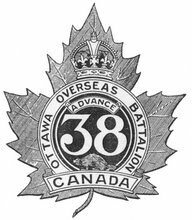 Joined the 95th Battalion, CEF, in Toronto, Ontario, on 1 October 1915 (number 201299) - taken on the strength of the 38th Battalion, CEF, on 8 or 9 April 1918 - struck off strength to England for duty on 24 April 1919.